Pop-up installation on Azusa Street. Sustainable Little Tokyo’s third Little Tokyo Artist Convening, bringing together traditional and contemporary artists who identify with the Little Tokyo community, will be held on Saturday, June 10, from 12 to 2 p.m. at the Japanese American Cultural and Community Center, 244 S. San Pedro St. in Little Tokyo. — Ideas for open-submission community art projects, such as the Windows for Little Tokyo, a neighborhood-wide pop-up exhibition in storefront windows to support local businesses, and JACCC Plaza installations and events. In past convenings, artists identified exhibition and work space as their greatest need. 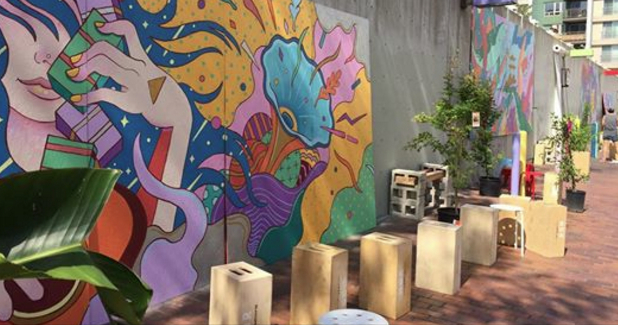 SLT chose the neglected Azusa Street and created two pop-up installations with murals, sculptures, participatory art, mobile seating, and a community garden. SLT artists have also painted community-specific art on utility boxes and the JACCC kiosk on Hashimoto Plaza, and created #MyFSN posters to draw attention to the First Street North campaign for community-centered development. SLT envisions a healthy, prosperous Little Tokyo that maintains its historic and cultural roots for future generations. Its mission is to develop a dynamic, community-driven future for Little Tokyo through green initiatives, small business development, and cultural and arts programming that perpetuates its historic character for generations to come. For more information, visit www.sustainablelittletokyo.org.